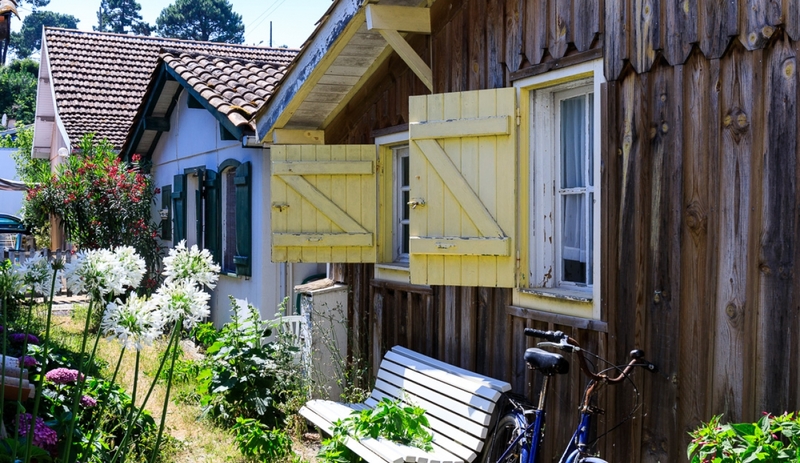 A lovely rental in a beautiful corner of France and ideally located for an easy, relaxing holiday. 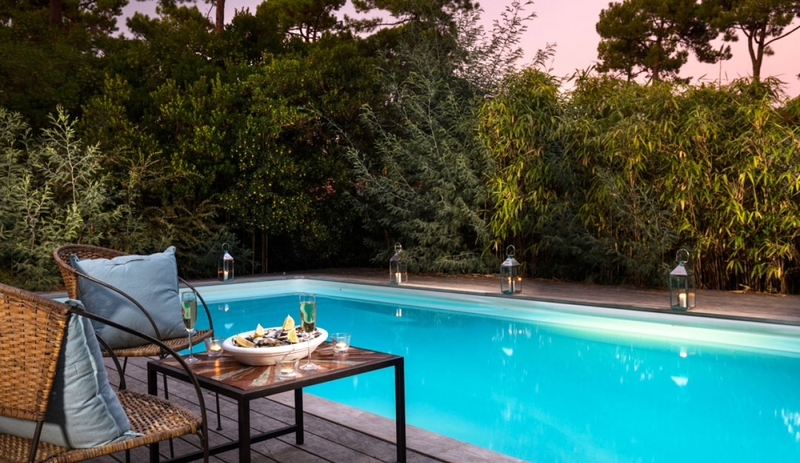 Good quality villas with pools are notoriously hard to come by in Cap Ferret, and Villa des Cigales is a very welcome addition to our portfolio. 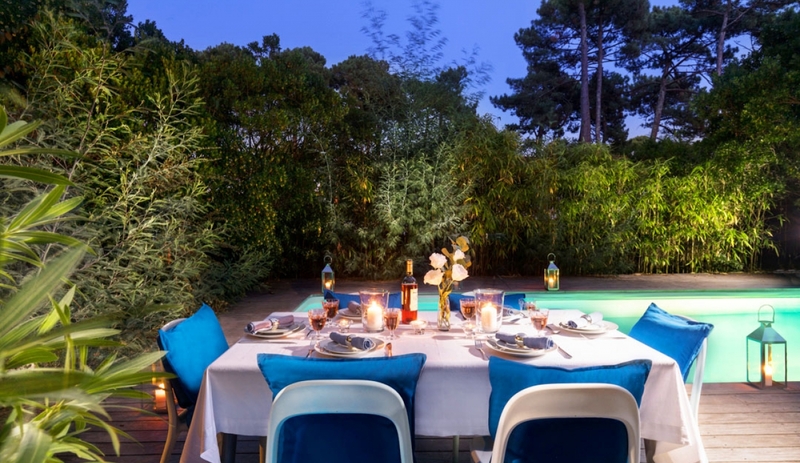 The garden and terraces provide lots of outside space, there's a good-sized pool and a fresh, modern, summery interior. 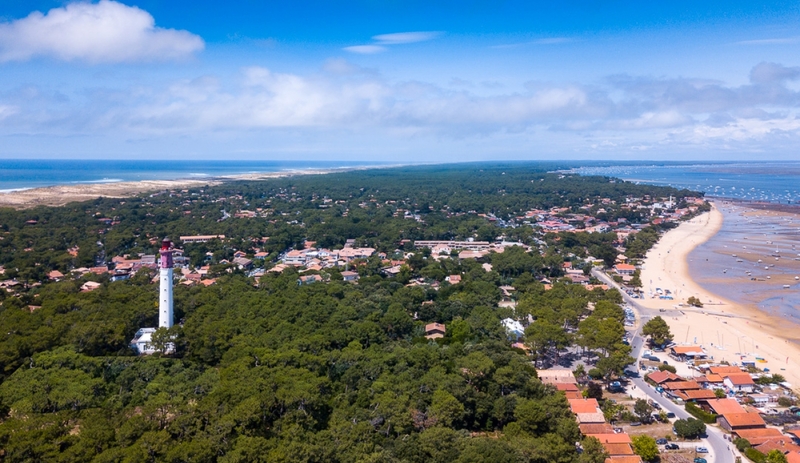 The market is a short walk away, local beach, restaurants and oyster-farming villages a bit further, Atlantic beaches a short bike ride. If all this sounds lovely, it's because it really is! 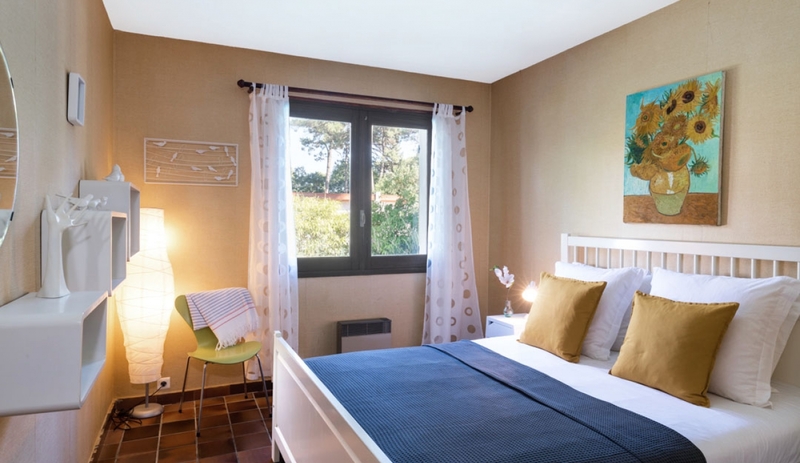 It is ideally suited to 1 extended family or two families with children wanting somewhere that is convenient for exploring this lovely corner of France, but also comfortable & spacious enough to spend time in on days you don’t want to move far. Toddlers - No steps inside. Uncluttered interior. Cot (no linen) & high chair provided. Teenagers - Easy bike ride to beaches and shops. Surf and tennis nearby. Reduced Mobility - Ground floor accommodation makes it a suitable let. 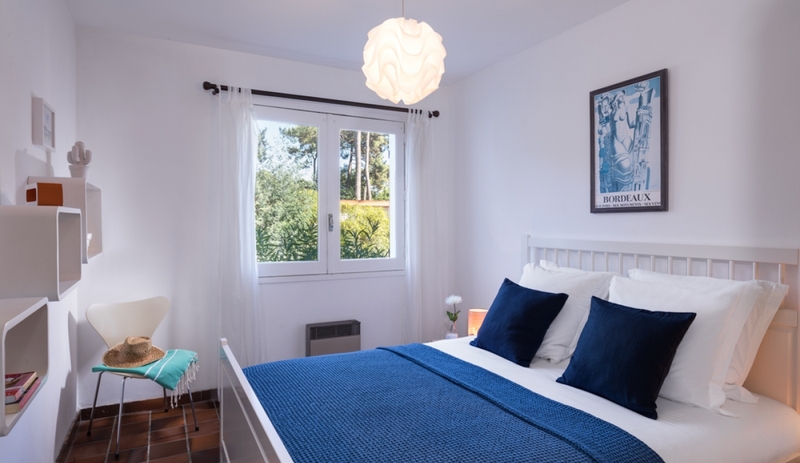 The villa has a sleeping capacity of 8, the living space indoors is probably more comfortable for 6, but the evenings are warm enough to sit outside so really there's plenty of room for everyone. 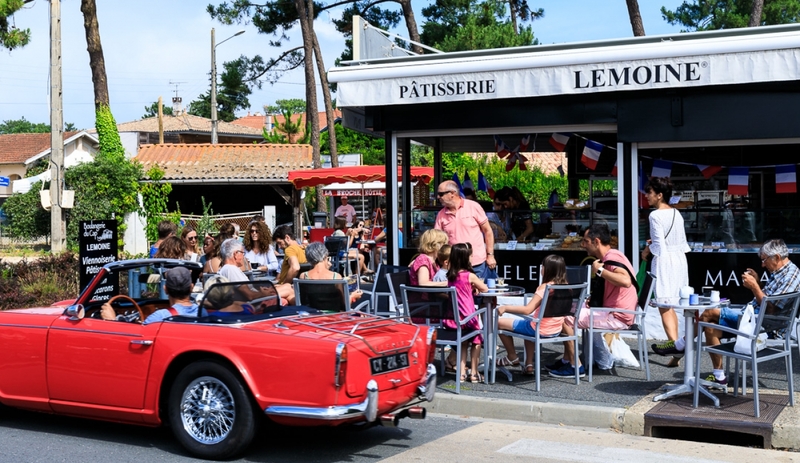 We’ve not met anyone yet who has been to Cap Ferret and not come home a complete convert, but it’s worth noting that it is an area of natural, unspoilt beauty – in spite of its reputation as a upmarket destination it is not conventionally luxurious in the same way as Cap Ferrat (on the Med, often confused with Cap Ferret), but has a laid-back ‘beach-chic’ style of its own. 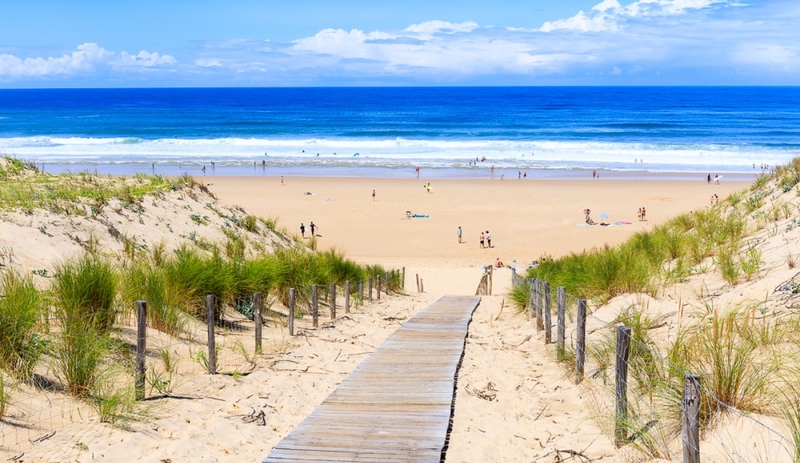 It also means that apart from beaches, surfing, sailing, exploring by bike and eating out, there isn’t much to do. But what else do you need?! 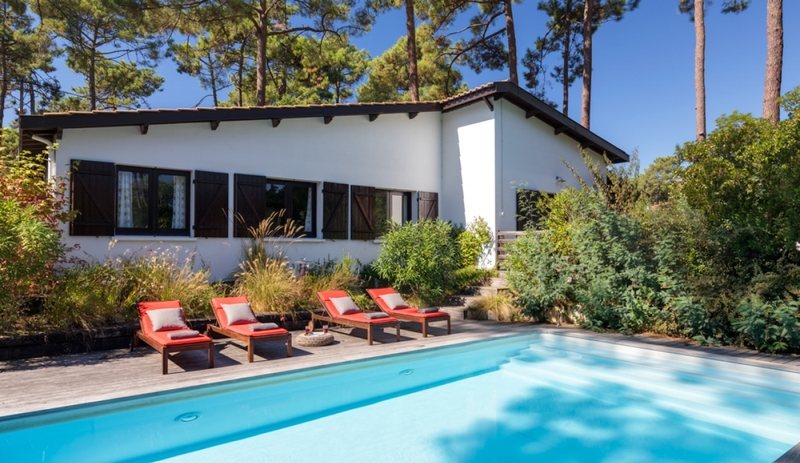 Maison des Cigales is a classic 'maison landaise' typical of Cap Ferret, a single storey villa with a broad sloping roof with timber features, characterful brown shutters and large hardwood entrance door. 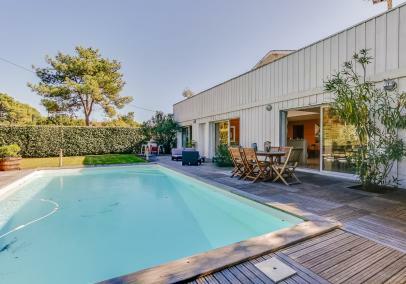 The house stands in a good-sized plot (700m2) set back from the road. Mature trees at the front provide plenty of shade on hot days. There is off-road parking for two cars. The house is about 35 years old with many original features: tiled floors throughout, living-room fireplace, built-in external fireplace/barbecue. There are tall French doors opening to the rear garden, deck & pool area. 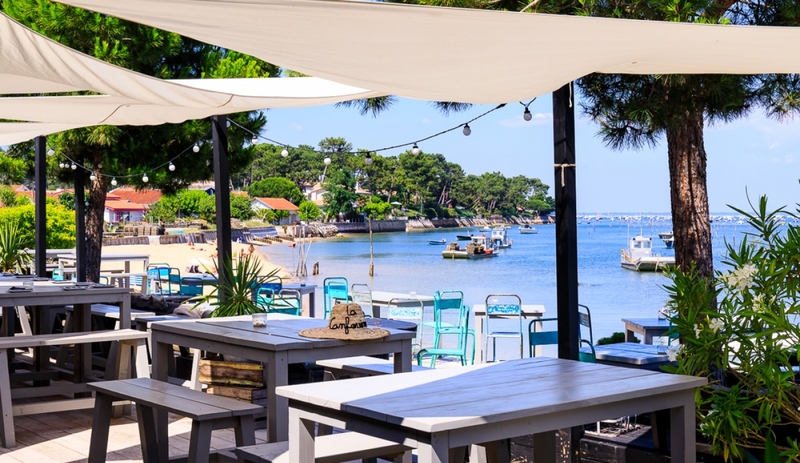 The current owners have recently brought the furnishings and décor up-to-date whilst retaining its French character to create a lovely, relaxing holiday home in keeping with Cap Ferret's stylish, relaxed environment. They stay themselves as much as possible so it is equipped very much as a home, including a selection of indoor and outdoor toys. The entrance leads into an L-shaped hallway serving the kitchen, living/dining room, bedrooms & bathrooms. 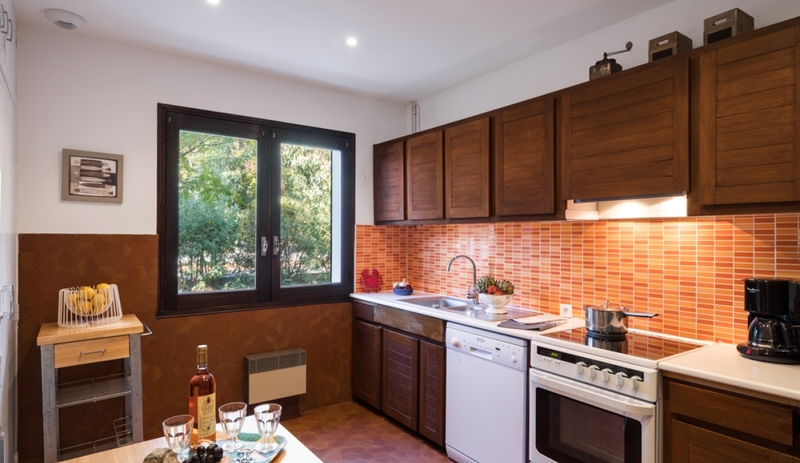 The separate kitchen isn't large but is well-equipped, including oven, hob, microwave, refrigerator, washing machine, dishwasher, kettle & coffee-maker. There are tall windows opening over the front garden, plus a breakfast table seating 4. The living/dining room is a good-sized, sunny room with two sets of French doors. Two sofas provide a comfortable reading/drinks area around the fireplace (seating 4-6). This area sits behind a large modern dining table which seats 8 comfortably. There are four bedrooms of approximately equal size (20m2 approx. ), all pleasantly furnished. 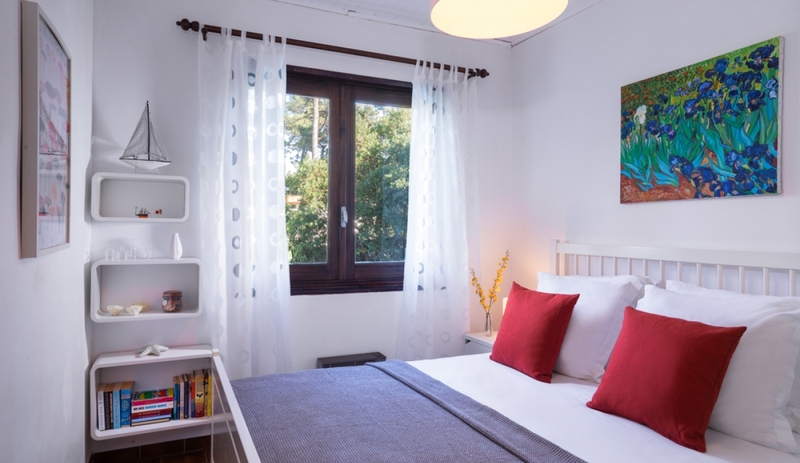 Three are double bedrooms (160 x 200 cm beds), each equipped with wardrobe, drawers and shelves. All of these rooms overlook the rear garden & pool. The fourth bedroom is a twin (2 x 90 cm beds) with shelved wardrobe and overlooks the front garden. The family bathroom includes bath, shower, basin & toilet. A second shower room is located at the end of the corridor; there is also a separate second WC. 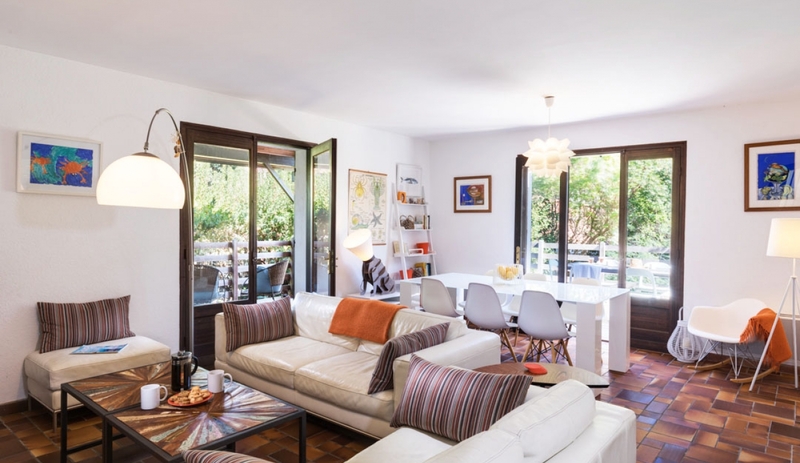 The good-sized & varied outside space at Villa des Cigales is a very appealing feature of this property. 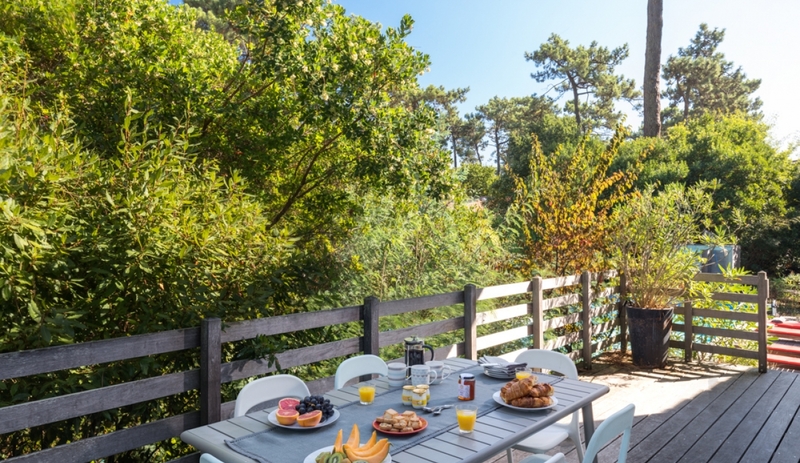 It is a typical Cap Ferret garden, with a very 'natural' feel and includes several pine trees. French doors on two sides of the living room open onto the attractive rear terrace which runs around the rear of the house. The terrace is covered on one side to provide a lovely salon d'été (summer sitting room) around a large barbecue/external fireplace - perfect for cooking & relaxing at night once the heat has gone out of the sun. The other part of the terrace overlooks the rear garden & pool, and makes a great spot to read or sunbathe. Steps run down to the pool & deck area, which includes an outdoor shower cubicle. The pool can be shut off from the rest of the garden by a gate at the top of the steps from the terrace, and 1m20 fences with gates at the side of the house and in the garden. The salt water pool measures 9m x 4m, with a maximum depth of 1.5m. 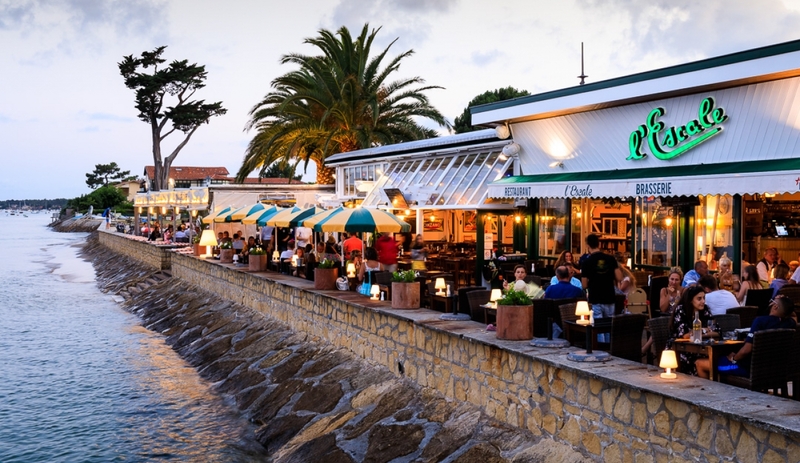 It is heated, protected by a cover and is open from late-May until October. The rest of the garden is mature, with enough space and tall enough shrubs for a game of hide-and-seek! There is also a trampoline in the back garden. A 1m80 fence surrounds the plot, but because the grounds slope down in the far corner behind the pool a neighbouring property partially overlooks the garden (but bamboo provides some screening). However it is from part of the neighbour's plot that is rarely used, and the owners are seldom there. 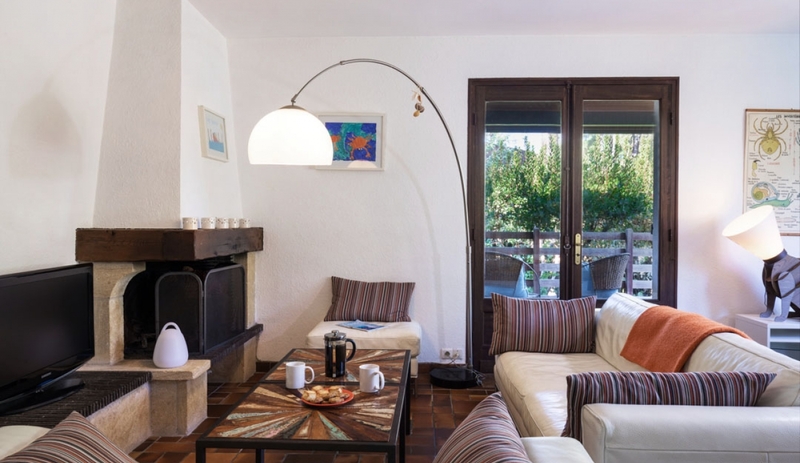 In all, Villa des Cigales is a lovely, family holiday home in a calm, convenient location. Heated 9m x 4m, salt water pool, up to 1.5m deep, protected by a cover. There is also a fence and gate. Open late-May to October. 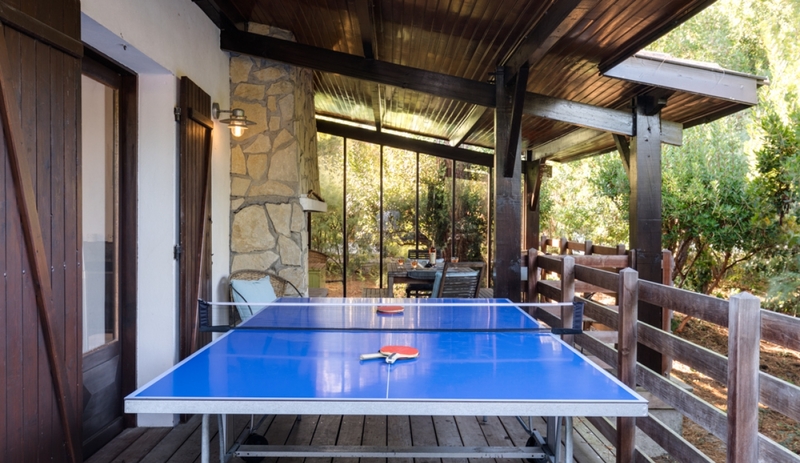 The house is also equipped with a trampoline (with surrounding net.) On arrival you will be asked to sign a declaration of responsibility for using the swimming pool and trampoline. 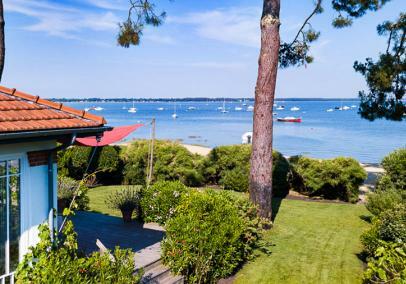 Villa des Cigales is located in Piraillan, one of several small Cap Ferret towns and located about half-way down this lovely sandy peninsula. 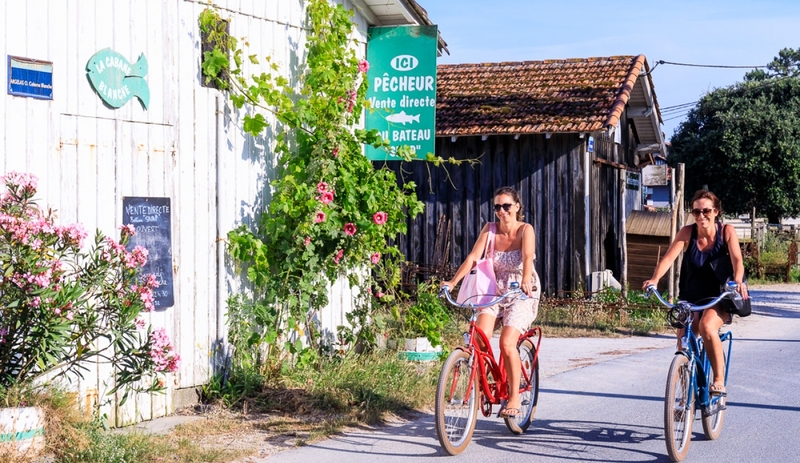 (Piraillan's oyster-farming quarter is one of France's heritage villages.) 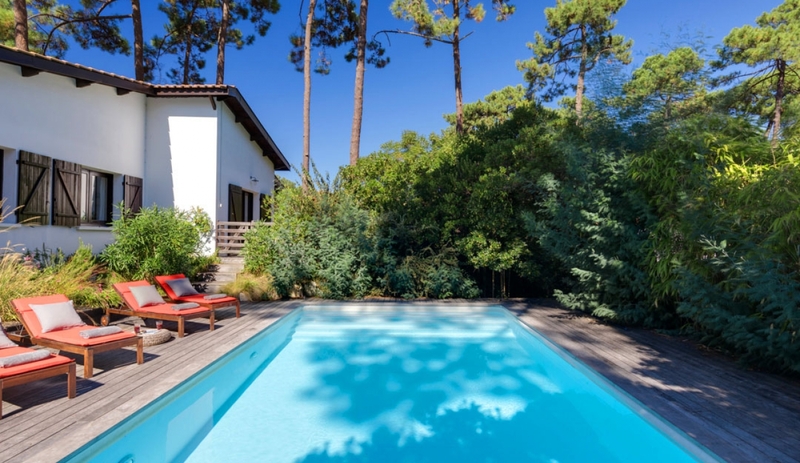 The villa is on a pine-tree lined avenue, a short walk from Piraillan market (July and August only) and about 150m from the main road connecting Cap Ferret's villages. Market: Piraillan (July & August only) 100m! Product: Good location, quiet and walking distance to food shops and restaurants. 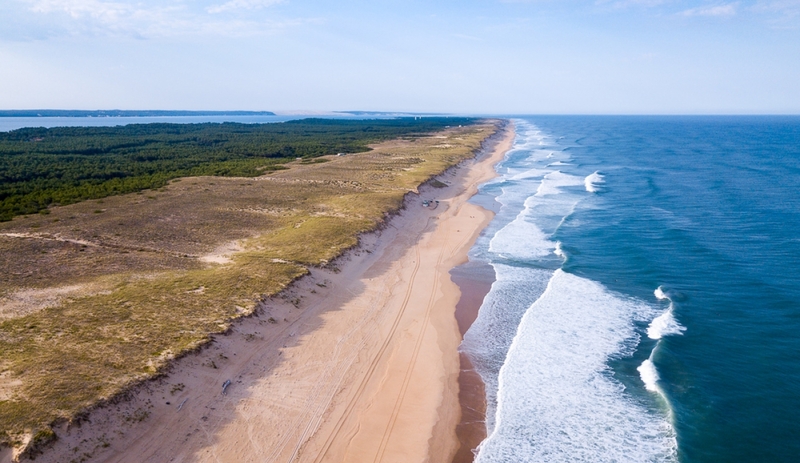 Not too far from great beaches. Great pool although a little overgrown around garden. Furniture good, plenty of space but decor and kitchen very outdated for the money. Product Comment: Thanks very much for your feedback. We're at the end of another very long season at Villa des Cigales and I can understand that the gardens will now need more time than can be given on changeover day. Equally we are speaking to the owner also re some interior improvements in time for next season. Product Comment: It's one of our most popular villas. Service: Efficient, friendly staff. Gave confidence in product - important as this was our first experience of them. Good email confirmation of each step of the booking and payment process. Product: Good: great pool, convenient and peaceful location, covered decking area for outdoor eating, homely feel, bathroom, process of arranging entry, cycle hire, restaurants and food shops within walking distance. Less good: kitchen not clean, dishes in dishwasher when we arrived, faulty kettle, little padding for hard wooden sunloungers, some towels had been stored damp and smelled. Cost and process of arranging exit clean (which we didn't take) wasn't smoothe. A second set of front door keys would have been useful. Product Comment: Good feedback thank you - on the whole. Our focus, naturally, is on the 'less good' items! Please accept our apologies re kitchen cleanliness. All of these things are easily rectified and we will speak to the cleaning company & owner. Service: We have been away with Alternative Aquitaine before, and will certainly do so again! Their selection of properties is fantastic, and they couldn’t have been more helpful when booking my holiday. The booking process is friendly and efficient, and the information sent to us before our holiday really helped us to make the most of our time away. Thank you AA! Product: What a find! 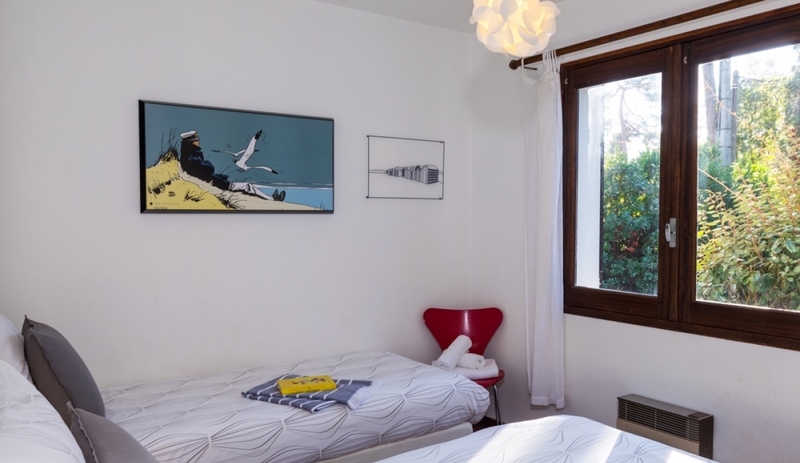 From the moment we arrived at Villa des Cigales we felt completely relaxed and at home. The villa was clean, well-provisioned and perfectly designed for two families holidaying together, with plenty of room for us all. The location couldn’t have been better – a beautiful cycle ride (or run a couple of times!) 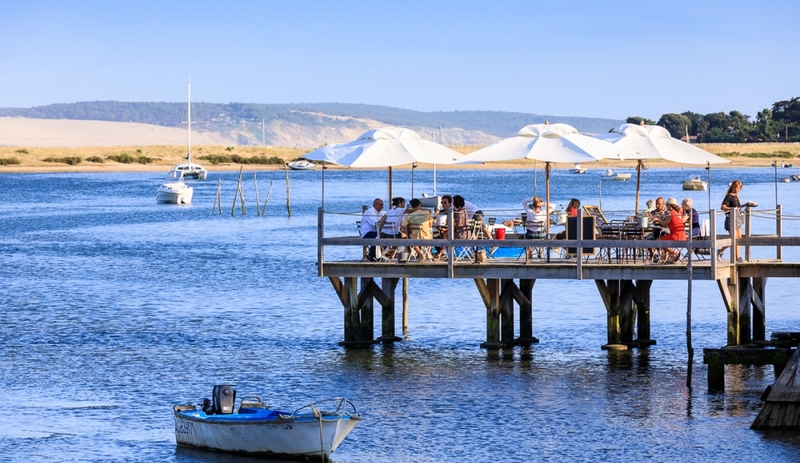 to the beach; walk to the bay with its own beach and oyster beds; fantastic market right on the doorstep (selling everything from delicious local produce to quality jewellery and clothes). 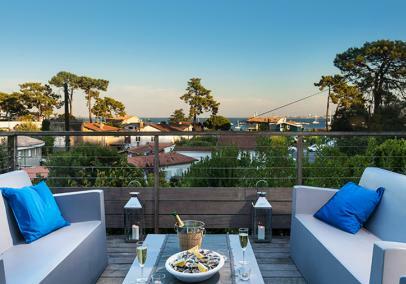 Our teenagers had plenty to do to keep them occupied, and the chic centre of Cap Ferret was only a short bike ride away. A huge thank you to the owners - we’ll definitely be coming back! Service: Quick and efficient booking, payment and replies to enquiries. Would recommend. Service: Alternative Aquitained were good, they told you when you would receive invoice and make payments and kept to these parameters. The map and pack information was very useful. 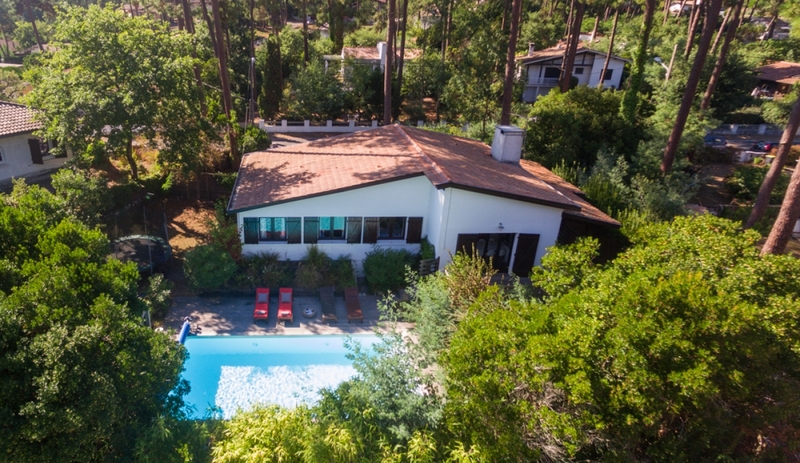 Product: The property in itself is very nice, in a nice area and situated in a quiet road, the pool is very nice. However, it was quite dirty on arrival and we ended up cleaning all the bathrooms, kitchen, BBQ, oven and cupboards ourselves. The dishwasher was blocked as the filter was very dirty, and the toothbrush holder had probably never been cleaned. Service: Service was good although I had to ring a week before to ask for villa details to be sent. Think staff should also have a more detailed knowledge of services from Bordeaux airport. Part of our party were students flying into Bordeaux airport which differed from our arrival time but staff were unable to tell me about public buses - apparently nobody has ever asked because everyone hires a car! Product: The villa was lovely - a real,home from home. We had an amazing holiday and will definitely be back. Product: We had an issue with the cleanliness of the villa on arrival, but this was dealt with quickly and efficiently by the owners.